Share what you thought about Shards in the Sun and earn reward points. This story is great. If you love Cowboys you’re going to love this story...This book flows like a river. The Supporting Cast is awesome and they make really good sidekicks...If you love Cowboys. If you love Texas. If you love ranches with horses, and if you love snappy dialogue, then you will absolutely love this book. Since this is the first book in a new series, there's lots of world building, background information, and introduction of new characters, but it was so intricately woven into the story, it did not interfere with the flow...Trina's tale reminds everyone to follow their dreams and be true to yourself. Thanks, Trina, for an enjoyable, passionate book. I can hardly wait for the next one in the series. This book was a very good read with roadblocks for the two men at every turn. Just when I felt they was on the same page something happened and they had more issues arise...What I like best about this book was the very last line in the book left me riling and wanting the next book in the series now. Can’t wait for it to come out so I can find out what is going to happen next. 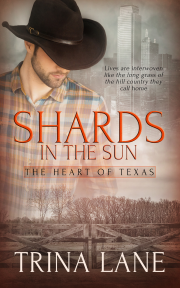 Trina Lane has created two very likeable characters in Brandon and Tyler, and I liked their disparate backgrounds...Shards in the Sun has shown us a well-developed world, and I look forward to reading more in the series. A sweet opposites attract story. Brandon is funny, his friendship with Jes and his mother are well developed.